Details in the Diedrich’s new kitchen include carved corbels, heavily-veined granite, a limestone hood, and a hammered-copper sink. The white cabinets were chipped, the floor scratched, the double ovens too small for roasting pans, and the island stovetop in the way when the homeowners were entertaining. 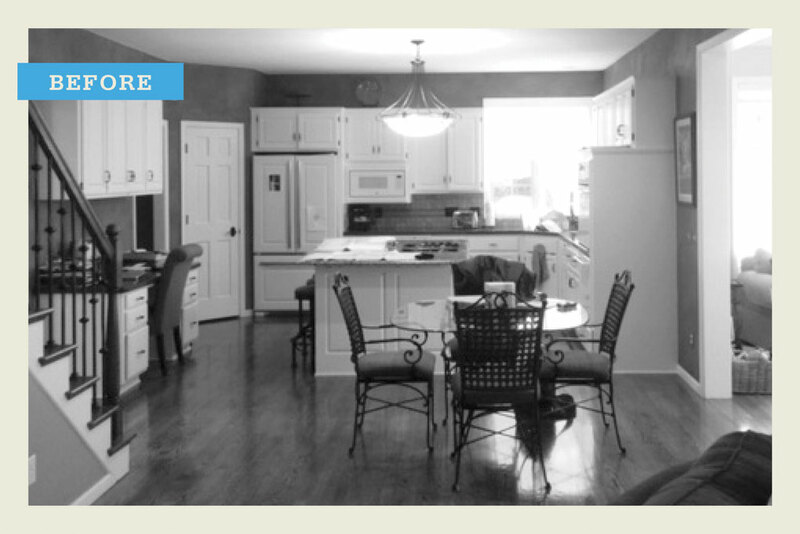 For years, LeeAnn Diedrich knew she wanted to remodel the kitchen in her Woodbury home. “It was just tired,” she says. She could even picture its Italian-inspired replacement. But she didn’t know how to make it happen. It wasn’t until they met interior designer Lynn Woodruff-Peterson through a mutual friend that they saw a way forward. Woodruff-Peterson, principal of Lynn Peterson Design, considers it part of the interior designer’s role to build the team needed for such a project. She immediately brought in architect Andy Campbell, of Andy Campbell Design Co. in Minneapolis, to help her. The design challenge: how to bring an old-world feel into a suburban house built in 1994. Seeing no need to move walls, they decided to transform the space with color, lighting, and craftsmanship. They began by drawing. They’d add beams to create drama and “humanize the space,” and upper cabinets that reached to the 9-foot ceiling and are topped with an elegant crown molding. “You can tell the age of a house by how the upper cabinets engage with the ceiling,” Woodruff-Peterson notes. They’d create curved archways for the openings between the kitchen and the living and sun rooms. They’d move the stove to an exterior wall and find space for a much larger refrigerator. Stand-alone cabinet, designed and built for the homeowners’ needs. The ellipsis-shaped archways, in particular, demanded collaboration. Mielke wasn’t sure how to do the framing, the designers weren’t confident about the curve, and the clients wondered if the opening would feel too small. In the end, the team built a mock-up for all to approve. Meanwhile, Woodruff-Peterson and Heizen worked together to design a stand-alone cabinet that had the look of an antique armoire and would function as a drop station as well as provide extra storage. In the new kitchen, colors, textures, and shapes blend, creating a room with visual harmony. 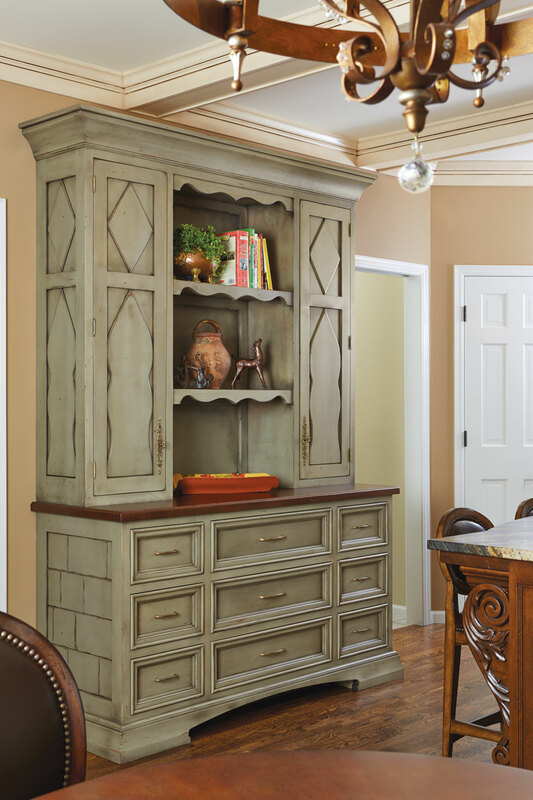 Intricately carved corbels dress up the rustic alder island, while hand-carved diamond and arrow shapes adorn the door panels on the earthy green armoire. The countertops are a heavily veined honed granite, the vent hood is limestone, and the farmhouse sink is hammered copper. 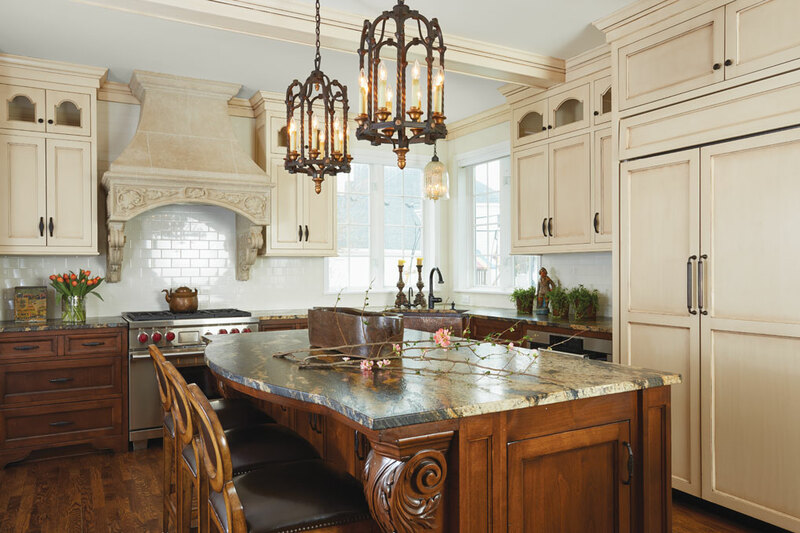 Large bronze chandeliers light up the island and table, and a contrasting mercury glass fixture hangs above the sink. The archways frame it all. Architect: Andy Campbell Design Co.